"Do you like the movie Shawshank Redemption?" Do you like the movie Shawshank Redemption? Do you like running? Then this is the perfect race for you. I am a huge movie buff. When I heard about this race I knew I’d want to drive 4 hours to Ohio to participate. I’ve done this race 2 times. Both were in May however in 2019 for the 25th anniversary of the movie they are moving to July. 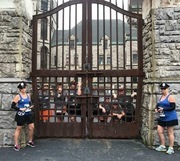 The race takes place near the prison where the movie was filmed. You get a ticket to tour the prison with your race fee. They give tech shirts. 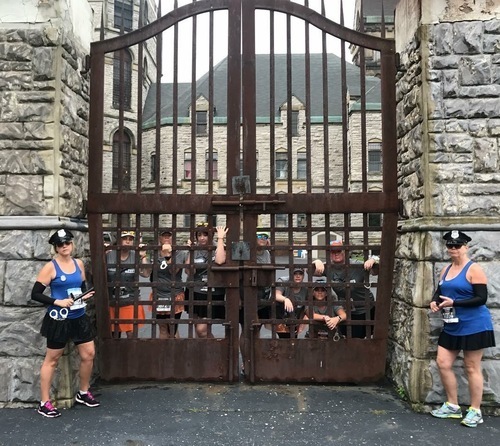 In 2018 they added a little fun and decided to divide half the runners into guards and the other half into prisoners. I did with a group of friends and we all planned to dress up as prisoners and I found out I would be on the guard team so had to change my costume. It had to match my bib afterall. They do encourage costumes and even have a costume contest. It is a really fun prerace atmosphere. With a lot of space, ample parking, fun music and great post race treats. Let’s discuss the course. I’m from Buffalo and it is very flat where I live. This course is hills hills and more hills. Just a warning. But you run through the town of Mansfield. A cute small town, also with a few filming locations from the movie. They had a few water stops and we’ll manned by police to keep roads closed. 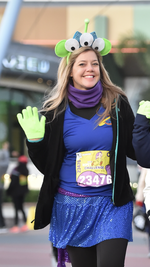 Its a pretty big race and I did notice some walkers so if this race excites you but afraid you can run it I think you’ll be ok walking the whole thing. The medals are amazing. Almost on par with a Disney medal. They’ve had different designs each year so always exciting to wait for the unveiling. I mentioned they had the prisoners vs guards in 2018. The winning team got a discount code for the 2019 race. Luckily it was me! The guards won! In 2019 with the anniversary they are going to have several actors from the movie there at the race. I highly recommend this one.